A lot happened in that year. In 1860, the Pony Express sent its first riders from Missouri to California. That same year, Abraham Lincoln was elected the 16th President of the United States. And on December 20, 1860, South Carolina declared its secession from the union, setting events in motion that would culminate in the American Civil War. It was in that same year, on December 2, 1860, that Charles Thomas Studd was born into a wealthy family in England. Charles was a teenager when his father committed his life to Christ after attending an evangelistic meeting led by D. L. Moody. A short time later, at the age of 16, Charles himself came to saving faith in the Lord Jesus Christ. What is all the fame and flattery worth . . . when a man comes to face eternity? I know that cricket would not last, and honour would not last, and nothing in this world would last, but it [is] worthwhile living for the world to come. How could I spend the best years of my life in living for the honours of this world, when thousands of souls are perishing every day? 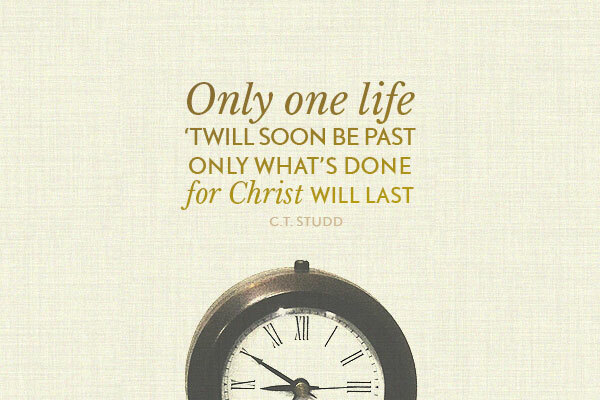 Armed with an eternal perspective and motivated by a desire to serve Christ no matter the cost, Charles Thomas Studd (often referred to by his initials, C. T.) left England to serve as a missionary in China, under the oversight of Hudson Taylor. C. T. Studd spent a decade in China, much of that time working in a rehabilitation center for opium addicts, sharing the gospel and seeing lives transformed by Christ. While in China, he also married his wife Priscilla, and together they had four daughters. After spending a few years back in England, the family moved to India, where Charles served as a local church pastor for seven years. Though he struggled with severe asthma, often staying awake most of the night just trying to breath, he faithfully preached the gospel. And as a result, many souls in Southern India were won to the Lord. Shortly thereafter, C. T. Studd became convinced that God wanted him to take the gospel to the innermost jungles of Africa. He eventually reached the Belgian Congo in 1913, though it was not easy. At one point, he contracted a severe case of malaria; on another occasion, he woke up in the morning to discover that a poisonous snake had been sleeping by his side all night long. Along with his fellow missionaries, Studd established a number of missionary stations in the heart of Africa — bringing the gospel to tribes that had previously never heard the name of Jesus Christ. He wrote over 200 hymns, translated the New Testament into the native language, and witnessed thousands of African people turn to Christ. C. T. Studd died in Africa, at the age of 70, having spent almost his entire adult life in missionary service: 10 years in China, 7 years in India, and roughly 20 years in Africa. Through his unwavering perseverance, a vast number of souls were reached with the good news of the gospel.